4. Eating too much: What else can I say, except especially eating foods high in carbohydrates? When Terry and I switched to a low-carb, high fat diet four years ago, one of the positive effects was that my level of happiness went way up! It was probably mainly because I was no longer hungry…ever. 5. Tardiness: Not fun. My days of putting on make-up at red traffic lights and racing to my destination with not enough time, are over. I read somewhere, “Punctuality is honoring someone else’s time.” When you stop focusing on the time you are supposed to be somewhere and instead focus on the time you should leave to get to the event on time, you will be punctual. 6. Unbalanced checkbook: Guessing what’s in your account leads to overdrafts and overdrafts lead to bad credit and bad credit, well I don’t have to tell you where that leads. If you don’t know what your balance is, maybe it’s time to use cash. At least when it’s gone, you’ll know it. Keeping a current balance in your checking account will save you grief that can sap your joy. 8. Sleep deprivation: Get your rest. Set a bedtime that gives you the amount of sleep you need and make it a habit. The computer is one of the biggest sleep thieves you own. Don’t let it turn into a depriving machine. Speaking of centerpieces, in October, I like to pretend I’m driving through a huge centerpiece on some giant’s dining room table. My husband and I love to take at least one day trip around our beautiful state of Washington to get a centerpiece fix for the year. Be sure to get a centerpiece drive on your calendar while the leaves are gorgeous or you’ll miss out. When I got organized, one of my intentions was to get the leaves on the calendar as well as “pick wild blackberries,” “build a snowman,” “swim in the river” and “play in the dirt.” I found during those busy child rearing years if I didn’t get those kinds of activities on my calendar I’d miss out on a lot of joy. By taking a serious look at those behaviors that sap our happiness and insisting on enjoying the on-going, ever changing miracle of this life we are privileged to have, we can up our happiness quotient HQ. Now that you’ve finished this essay, do NOT write on one of those little squares of your soon-to-be-replaced calendar: Dr thru lvs prten in giant cnterpc. Oh, one more happiness sapper is clutter! 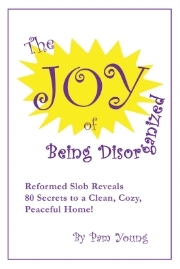 I'd like to give you the chapter in my latest book that's all about reducing the clutter in your life.